With the gap between rich and poor widening in the USA, the world’s richest nation is now struggling to employ, house and feed its poorest, the BBC finds in two American cities. Colorado is bitingly cold at this time of year, the temperature often below zero on most days. In the state’s capital, Denver, America’s new homeless venture out into the bitter evening air, victims of an economic downturn that started during the last presidential election year in 2008 and will continue into the 2012 election cycle. The economy is likely to be the key issue in next year’s presidential election, and the latest census data suggests that nearly one in two people in the US have either fallen into poverty or are struggling to get by on a low income. 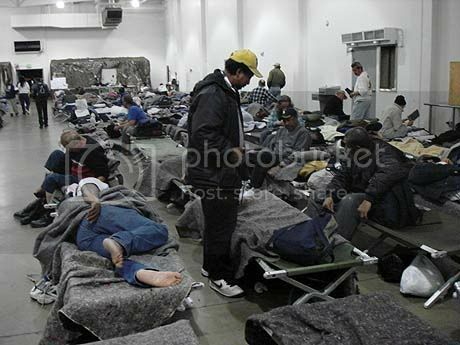 Homeless shelters offer a place for comfort and food in harsh times. 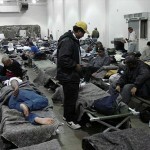 As many as 3.5 million Americans are thought to need shelter at some point in the year. And there has been a sharp rise in the number of people homeless for the first time, especially families with children. Robert and Victoria Venegas and their six children have been living at the Aristocrat Motel for nearly two months. The family had to leave their home when they were unable to meet the monthly payments when Mr Venegas lost his job as a painter and decorator this autumn. Ms Venegas said: “We had a home, we had a yard for the kids to play in. We had two dogs, two wonderful dogs that we don’t have any more and I was able to cook. “I used to make dinner every night and now I can’t even cook for my family. That’s hard.